Americans are dead in "solved" cases of product poisoning. The Made-In-China products were exported from Communist China / the P.R.C., and imported by the United States of America. Americans are dead. Is this acceptable? * 2006: 138 citizens in Panama died after taking cough syrup, contaminated with diethylene glycol from the P.R.C.. As many as 260,000 bottles of cough syrup were contaminated, and diethylene glycol was also found in toothpaste. * 2007: The United States experienced the arrival of toothpaste with diethylene glycol. This included counterfeit knock-offs of Colgate and Sensodyne toothpastes. Also affected: Australia, Costa Rica, England, and Spain. * 2007: The United States experienced the pet food recall as American cats and dogs dropped dead in the thousands. The melamine contamination originated in China. Contamination was also found in animal feed for pigs, chicken, and fish in the United States and hence, in the human food chain as well as the supply of pet food. Additional contaminated foodstuffs included wheat gluten, corn gluten, rice gluten and protein concentrate. * 2007: Chinese textiles in Australia were quarantined after formaldehyde was found at 10X the level of safety standards. * 2007: The United States experienced the recall of 450,000 Made-In-China tires that were found faulty by the National Highway Traffic Safety Administration. * 2007: It was almost "the year without a Christmas." The United States experienced recalls of 19.5 million Made-In-China toys, due to lead paint and faulty magnets. Normal American families began to change their shopping habits to avoid Made-In-China toys. * 2008: Frozen Chinese dumplings, contaminated with pesticide, sickened 10 people in Japan and perhaps more. * 2008: The United States experienced the recall of Baxter blood thinners, made with counterfeit heparin from the P.R.C.. 81 Americans died as acknowledged by the U.S. FDA. As recently as November 6, two days after your election, the FDA seized 11 lots of heparin from Celsus Laboratories Inc. of Cincinatti, Ohio. Also affected: Australia, Canada, EU, Japan, since those were destinations for Celsus products. The contaminant: over-sulfated chondroitin sulfate (OSCS). The above situation includes 81 American fatalities, and at least one other U.S. fatality made the news from this wave of poison products. Further, fatalities can be vastly under-reported. We saw this in the pet food recall of 2007. The FDA received reports of 8,500 animal deaths and confirmed 14 cases, so the news reported 14. (An independent web site separately collected 3,600 reports of dead pets in the US.) The disparity suggests that Americans watch "fairy tale" news, sanitized for the comfort of Communists and their business partners. We must ask this question: How many more Americans are dead, beyond the public reporting? The China Support Network, the sponsor of this letter, will never forget another example of U.S. news under-reporting fatalities. --Upon Tiananmen Square's massacre in 1989, there were 3,000 people dead, and the reporting said so. Shortly thereafter, the media began its absurd, insulting, and highly offensive "climb down" to reporting 300 dead. So, first they disappeared 2,700 souls; then about ten years later, they disappeared the Chinese dissidents, the Falun Gong, and the China Support Network. Human rights concerns with respect to China only began to resurface this year, due to the Tibetan uprising / crackdown, and your commendable support for the Tibetan cause! In the case of the Falun Gong, U.S. China policy is as good as leaving the Jews in the gas chambers. The Chinese Communist Party (CCP) was covering this up during the Olympics. Melamine has appeared again, but this time it's in the human food chain, not just pet food. China's children have been sent to the hospital. They are the most vulnerable to melamine; 99% of sickness due to melamine has occurred in victims less than 3 years old. Reuters puts the total number of illnesses at 94,000, but thankfully(?) only four children have been reported dead. China's top three brands of milk were found to have melamine, among 23 suppliers thus far implicated. China's dairy industry now resembles the U.S. banking industry, with sudden collapses of longstanding silos. Sanlu was the first large Chinese brand implicated. Before the crisis, this was a $19.5 billion industry; now, it is a $6.5 billion industry. On September 17, the Hong Kong Stock Exchange halted trading of shares in Mengniu, another top brand implicated. The contamination is deliberate. Melamine, with its high nitrogen content, "fakes out" tests that are conducted on foodstuffs. Without nutritional value, it boosts test scores to make the protein content appear higher. The use of melamine is a cost-cutting measure and a way of cutting corners at the expense of consumer safety. Watered down milk, spiked with melamine, can test and appear to stand in for undiluted milk. The 2007 pet food recall already introduced the United States to melamine, which interacts with cyanuric acid to produce kidney stones and renal failure. Contaminated chicken feed has now led to contaminated eggs. Egg powder and milk powder are contaminated. The situation may be referred to as the baby milk scandal, but that is a misnomer because the crisis goes beyond babies and milk. Xinhua reports that the scandal was exposed on July 16, when 16 babies were found to have kidney stones. New Zealand dairy cooperative Fonterra, the owner of a 43% stake in Sanlu, says that it learned about the contamination on August 2. However, the World Health Organization (WHO) and the public only learned of contamination on September 11, after the Olympics. That is when the recalls started. The delay from mid-July to mid-September is an example of CCP leadership, playing politics with public health (to avoid tarnishing the Olympics). The WHO has labelled this "one of the largest food safety events" that it has had to deal with in recent years. WHO and UNICEF also jointly decried the "particularly deplorable...deliberate contamination of foods intended for...vulnerable infants and young children." On September 26, the WHO warned health officials around the world to be alert for dairy products of Chinese origin that could be tainted. On September 21, the government admitted that it was facing 53,000 cases; 10,000 more were reported by September 26; and by October 8, Reuters was reporting a total near 94,000 cases. The European Commission's Joint Research Center set up a web site about detecting melamine (http://irmm.jrc.ec.europa.eu/melamine). French authorities ordered all Chinese dairy products off shelves. At least 25 countries have done likewise. On September 25 the EU stopped imports of baby food containing Chinese milk. In Connecticut, authorities warned about White Rabbit candy that was found and taken off of store shelves there. Another brand recalled in the United States is Lotte Koala cookies. 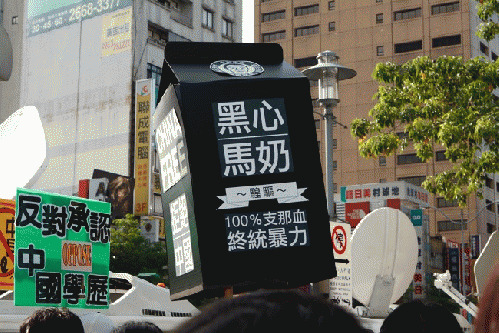 In non-U.S. markets, there have been consequences for brands of Unilever, Cadbury, and Heinz - and Starbucks' operation in China was supplied with milk from Mengniu. In China, there have been lawsuits and arrests and state promises of free medical care. Needless to say, Premier Wen Jiabao is very sorry. China faces a profound and humiliating loss of face. In this quarter, it is felt that threats and hazards to public safety deserve a response strategy that goes beyond an apology. If it cannot do better than apologize, then the Communist Party is showing its own limitations and shortcomings.